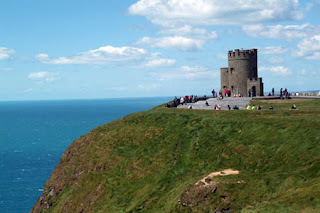 Home » Europe » Ireland » The Cliffs of Moher, Ireland's most visited natural tourist attraction. The Cliffs of Moher, Ireland's most visited natural tourist attraction. So beautiful, So amazing, the words to describe Cliff of Moher Ireland. It's Stunning views of the Atlantic and the coastal cliffs. 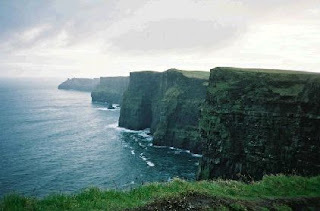 The Cliffs of Moher are Ireland's most visited tourist attraction. The Cliffs of Moher are 214m high at the highest point and range for 8 kilometers over the Atlantic Ocean on the western seaboard of County Clare. From the Cliffs of Moher one can see the Aran Islands Galway Bay as well as The Twelve Pins the Maum Turk Mountains in Connemara and Loop Head to the South. A unique experience is always encountered at the Cliffs including amazing views of the dramatic Atlantic coastline along 600m of pathways. The Cliffs of Moher are a must-see if you are visiting the West of Ireland. O'Brien as a viewing point for the tourists that even then were flocking to the Cliffs of Moher.O'Brien’s Tower was built in 1835 by local landlord Cornelius. The tower stands near the highest point of 214m. The views from the top are spectacular, the tower is open daily for tours of the exhibition on the first floor and the viewing area at the top. The Aill na Searrach wave view point is at O'Brien’s Tower. Aill na Searrach is the place where the 40ft wave raises it's head several times a year. Surfers can be seen surfing the wave from this point. 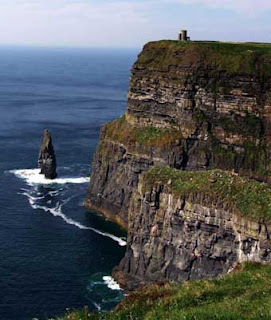 To reach the Cliffs of Moher you will need to arrange transport with a tour company or have your own car. Roads tend to be narrow as you approach the cliffs and the winds may be strong.